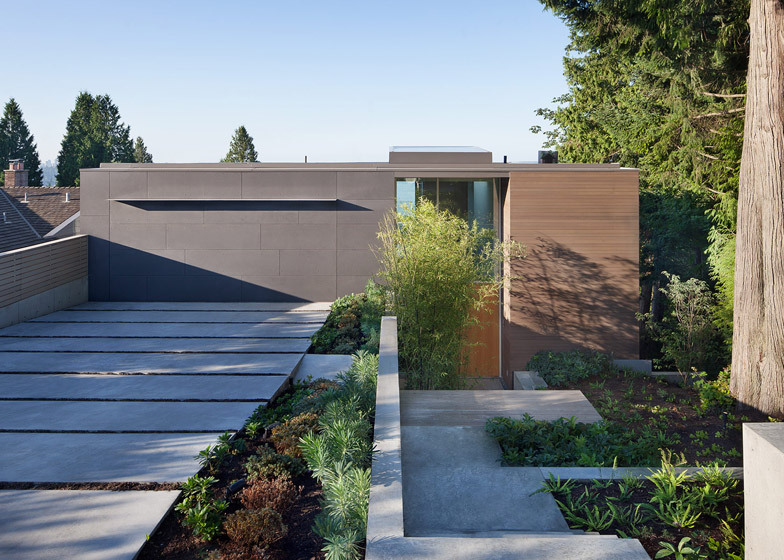 This Vancouver house by Canadian studio Splyce Design comprises a stack of glazed boxes set into a hillside, designed to maximise ocean views and create terraces on all three levels (+ slideshow). 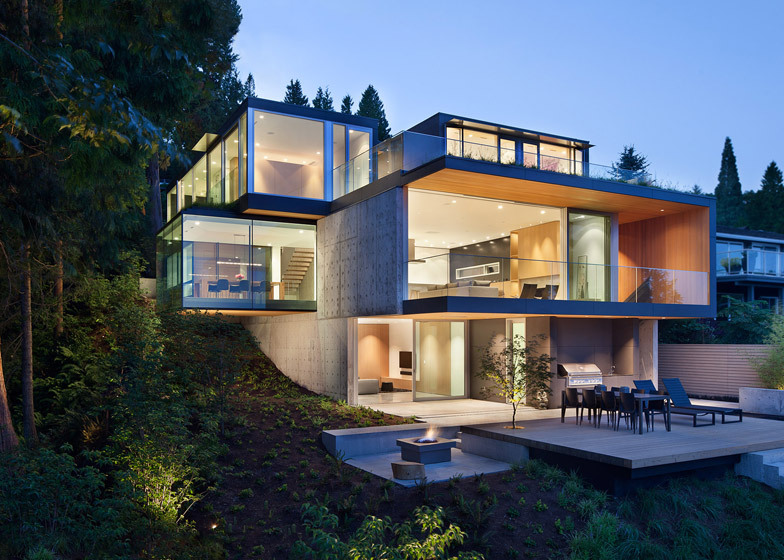 Russet Residence is built on a steep south-facing hill several blocks from the ocean, and enjoys clear views of the water, so Splyce Design created a stepped building with large glazed sections and a series of terraces. "The form of the house was shaped by the conditions of the site," architect Nigel Parish told Dezeen. "It pushes out and pulls back to gain views, satisfy the client's requirements, and satisfy zoning requirements." The house was designed for a family with two young children and has rooms arranged across three storeys. The main entrance is on the middle level, which opens on to a double-height stairwell topped with a skylight. "From this space, you gain an understanding and orientation of the home in relation to the site, its topography, and the movement of the sun across the building by way of the wall-to-wall skylight," said Parish. 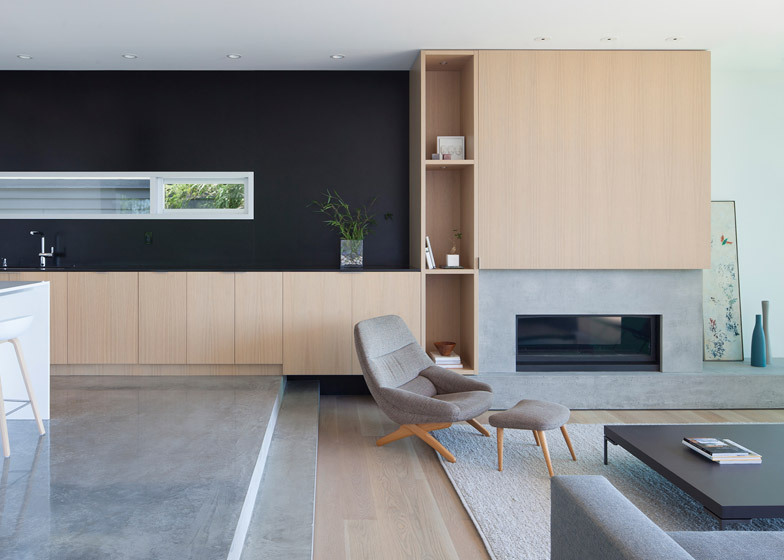 "Subtle hints of views to the sky, ocean and forest are also suggested from this vantage point, but it's not until you move deeper into the house that they are fully revealed." The entrance leads down to the kitchen and living room, which opens on to a covered terrace. Gradual changes in levels along the way are intended to echo the slope of the site. 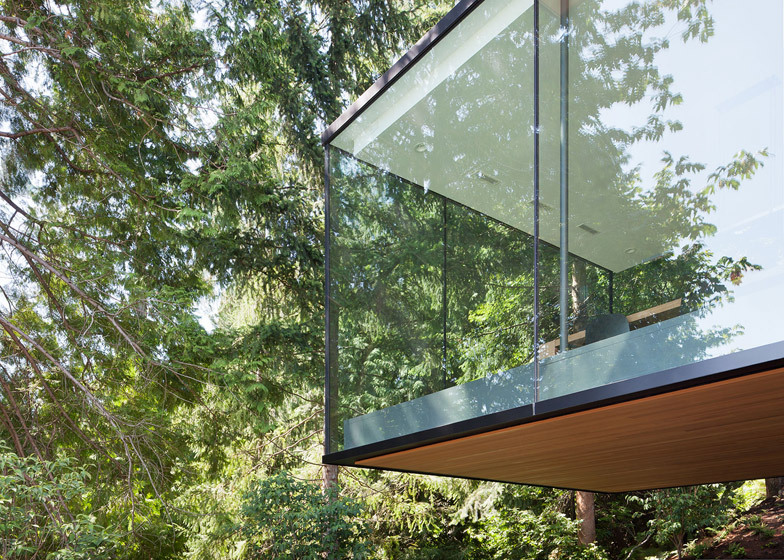 A dining room has also been cantilevered 4.5 metres off the side of this space, in order to bypass restrictions preventing the architects from building on the ground below, which borders a creek and forest. "A required set-back from the top of the bank pushed the building's foundation eastwards, and the resultant footprint was awkwardly narrow," explained Parish. 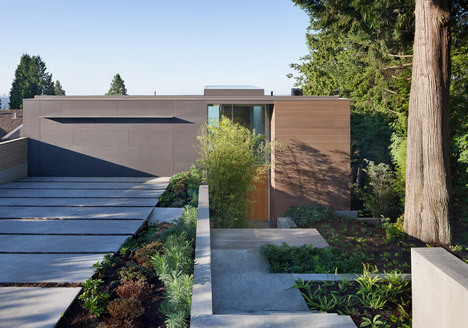 "To gain back valuable space, a portion of the main and upper floor has been cantilevered back out past the foundation." 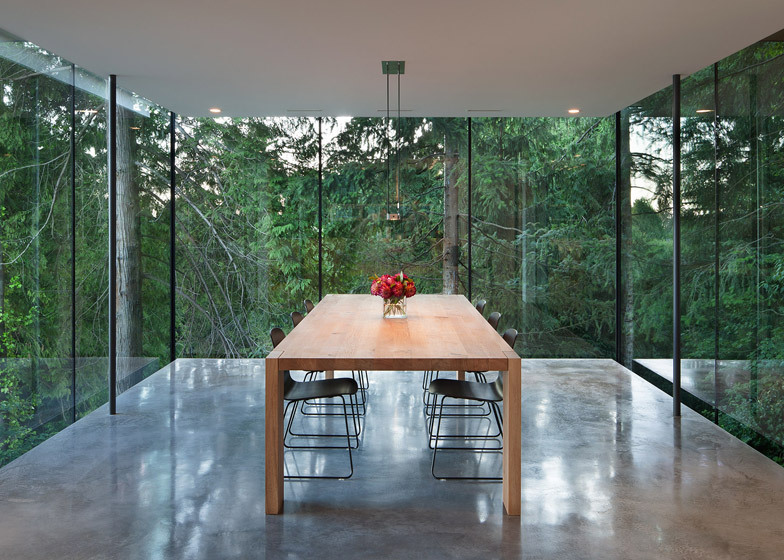 Three sides of the dining room are covered in frameless glazing that extends past the floor and ceiling, designed to make the room feel like it is floating among the treetops. 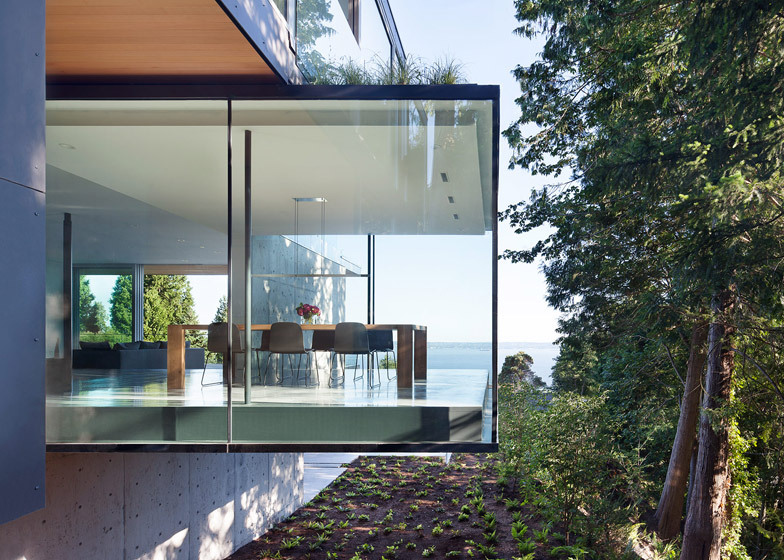 "By eliminating window frames and extending the glazing panels on all three sides of the room, past the floor and ceiling planes, the space dissolves into the adjacent forest canopy and provides framed views though to the ocean beyond," said Parish. External stairs lead from the terrace on the middle level down to the garden and pool below. "We wanted the main living spaces to be as close as possible to the lower level patio and landscaped areas, while maintaining the views out the ocean and forest," said Parish. "The owners spend a lot of time in the garden, so this relationship made sense." The lower level also features a media room, guest bedroom, two bathrooms and a wine cellar, while the top level has a garage, two children's bedrooms, a master bedroom, two bathrooms, and a terrace offering the home's best ocean views. The master bedroom and bathroom on the west side of this level feature floor-to-ceiling glazing, with trees from the adjacent forest providing natural shade from the sun. "We wanted every living space to have some type of access to the landscape whether it be physical or visual or both," said Parish. 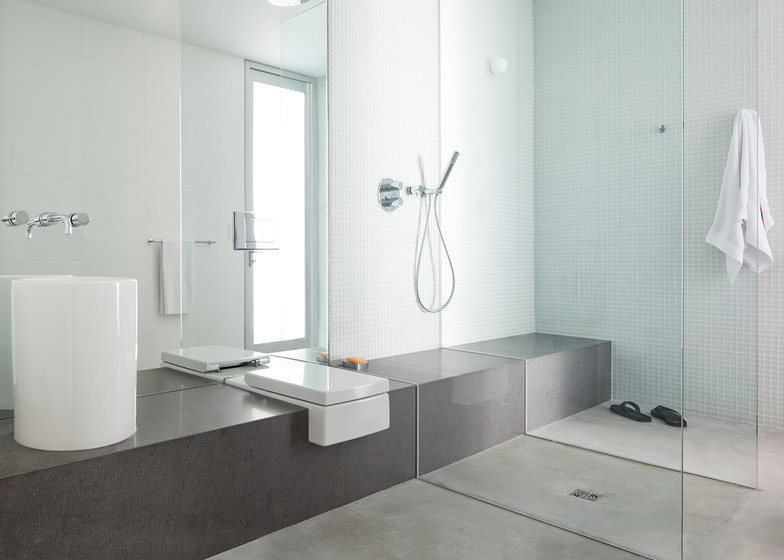 Honed granite has been used for a bench in the bathroom, and the walls have been covered in painted white glass mosaic tiles. 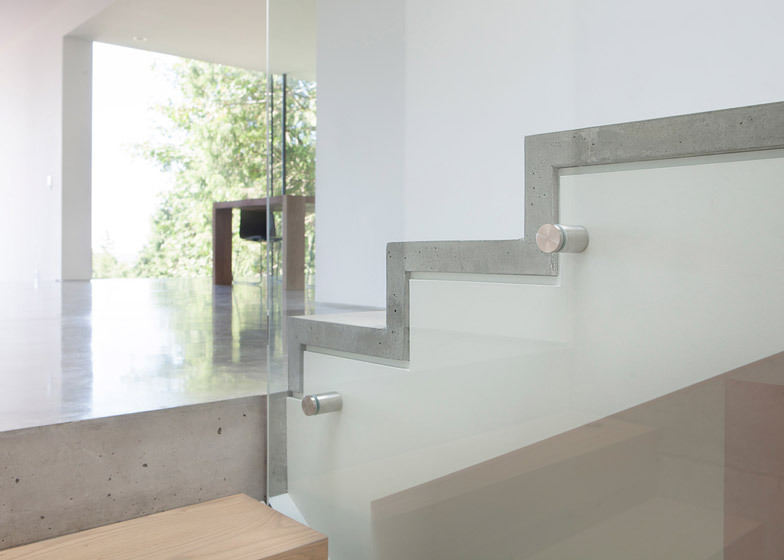 Polished concrete flooring features throughout the house, and a concrete wall has been left exposed beside the main stairs, running from the basement up to the top floor, in order to visually connect the three levels. "We wanted the floors to have a connectivity to each other in some way. One way to achieve this was with the continuation of wall materials and stair materials running from one floor to the next," said Parish. Warmer materials provide a visual counterpoint to the concrete in the main living spaces, with lightly stained oak veneer cabinets in the kitchen, and stained white oak flooring in the living room. Photography is by Ivan Hunter.